Wedding Ceremony at Rheilffordd Talyllyn Railway01654710472work Wedding Ceremony VenueThe Talyllyn Railway's tea room at Abergynolwyn Station is licensed to hold civil marriage ceremonies. Make your Wedding Day extra special, yet different and less formal - hire a steam-hauled train to collect you and your guests from one of our Stations between Tywyn and Dolgoch and carry you to Abergynolwyn Station for the wedding ceremony. The tea room will be reserved and prepared with flowers, table and seating for the formal ceremony. Afterwards, light refreshments can be served followed by photo opportunities around the station and train before it takes you and your party back down the line to the Station of your choice - you might think of using the Dolgoch Falls Hotel for your Reception, for example. We'll provide a special, personalised headboard for your own train service which is yours to keep. All the possibilities and arrangements can be discussed with us and we will be pleased to offer help and advice as you plan your special day. Each station you will use is a working one and your wedding will be individually organised to suit the requirements of everyone involved. The facilities are available most days of the year although it may be difficult to arrange matters for weekdays during our peak season (late July to end of August) because of the frequency of service trains. 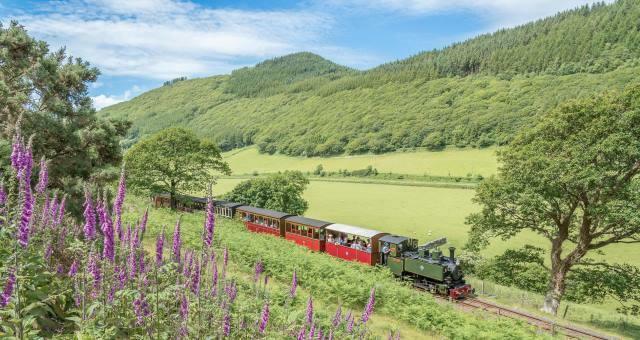 Your train and arrangements will therefore operate to a timetable suggested by the Talyllyn Railway and largely dictated by the normal service in operation on your chosen day. After the ceremony there is time for photographs with the train and light refreshments before you return to Tywyn in your special train, the total time taken being about three hours. The train carries an individual headboard which is yours to keep and you can choose the locomotive and carriages from the stock which is operational at the time. 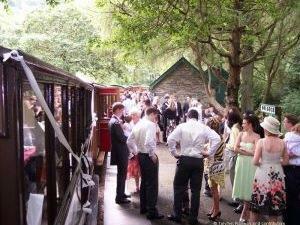 The Talyllyn Railway's tea room at Abergynolwyn Station is licensed to hold civil marriage ceremonies. Make your Wedding Day extra special, yet different and less formal - hire a steam-hauled train to collect you and your guests from one of our Stations between Tywyn and Dolgoch and carry you to Abergynolwyn Station for the wedding ceremony. You can download our wedding brochure using the link below or obtain a printed copy by contacting us. Each wedding is tailored to suite your needs and numbers of guests, contact us to discuss your special day this and pricing.